Rates are an often overlooked part of the four “Ps” of marketing – Product (or service), Price, Promotion and Place (distribution). They are also a big part of positioning. It’s similar to buying a car. You can buy an economy deal for a paltry price, or you can buy a cushy BMW. Both will get you where you want to go. It’s simply that one will get you there in a lot more style. BMWs are well-made cars, but the price also conveys a sense of quality and style that’s worth the cost. In the minds of your clients and prospects, your rates and fees can position you as a low-end rented brain or a valuable, high-end project partner. A lot of it has to do with your own sense of value and worth. Let me share a story to illustrate the point. It’s about a graphic designer but applies to writers, as well. I have two clients. One is a well-known designer with a high profile practice. He never went to art school, but is innately talented, has won loads of awards and attracts clients with deep pockets. He knows the value he brings to the table and is confident about what that value is worth. He can easily command thousands of dollars for a logo and his clients are happy to pay it. The other is an excellent designer, but also one who’s just coming out of a divorce and overcoming significant health problems. She had been charging the “going rate” rate for the most part. She also had some clients who were charged a lot less, mostly because she felt she wouldn’t win the gig if she charged more. We needed to run the numbers to see what she really needed to charge to cover her target salary, overhead and make a profit. What this designer had been through on the personal side was affecting her sense of value on the business side. It happens to indie pros and it happens often. Lots of business consultants say you need to separate personal stuff from business stuff. That’s true, I believe, but only to a point. Sure, you should have separate bank accounts, phone lines and such. But, the reality is that when things are stressful on the personal side, it’s going to affect your business and can easily affect your sense of worth and value. We had just done a promo mailing for her which brought her several new prospects. I suggested we use one as an experiment by quoting the new hourly rate. She was, shall I say, a wee bit doubtful but finally willing to give it a try. Off she went to the initial client meeting. During the meeting, she presented her value proposition and held her ground. The result? A new client at a higher rate … and the client didn’t so much as bat an eye when she quoted it. The designer had just given herself a $20/hr. raise. Not too shabby. The moral of the story is to accurately calculate your rate so you know your making money. But, you also need to develop the courage and confidence to quote that rate. Then, seek out those clients who understand the value you bring to their project and are able and willing to pay for it. That, in turn, means being selective about the prospects you woo and doing the background research to ensure they can pay your hefty fees for your brilliant work. When thinking about your value, consider this. Clients come to us because we have knowledge and experience they don’t possess. We can do something they can’t. It’s the same reason you hire an accountant, lawyer, financial advisor, plumber or mechanic. Beyond this, consider the return your client gets for your labors. Let’s say you write or design a direct response package that yields a few million dollars for your client. Yet, you charged a fee of, say, $500. That’s pretty disproportionate. Maybe it’s a logo you did for a new company. They, in turn, skyrocket to fame. Your logo design suddenly becomes very valuable as their face before the public. You’re worth more than you may think. Don’t sell yourself short. Based in Canton, Ohio, Neil Tortorella brings with him over 30 years experience as an award-winning graphic designer, writer and marketing consultant. He has operated his own design and marketing consulting practice, Tortorella Design, for over 25 years. He is the author of Starting Your Career As A Freelance Web Designer and Starting Your Career As A Musician both published by Allworth Press, as well as The Freelance Writer’s Business Book and Freelance Business Bootcamp. Angela Hoy's popular online class is now available in book format! in as little as 12 weeks! 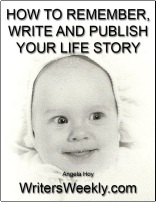 Angela Hoy's book will get you started! Using the memory notebook as your outline, write your autobiography! Also works for biographies and memoirs! Peek over the shoulders of highly successful, published authors to see how they landed publishing contracts worth $10,000 to $100,000! 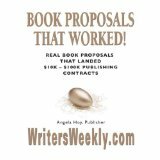 An enticing yet professional book proposal is the key! BONUS! Successful ghostwriter, Anton Marco, shares his secret for landing ghostwriting clients. Don’t miss Anton’s real ghostwriting contract at the end of this book! It provides an example of what he charges and the payment terms he requires from each client. 3 Responses to "Writers, It’s Time to Give Yourself a Raise! Here’s How! by Neil Tortorella"
‘Don’t sell yourself short’ was a good article, and in some cases it may be wise to take the advice offered. However it is also wise to remember the flip-side of the coin. You can push for a raise, but you may not get it — then you will have a choice to make, do I walk or do I back down and keep a paying job? I have already tried this game with a client of mine, knowing full well that they have a very good income from what I have done. The result was simply the statement, “Writers come and writers go, you decide”. I kept the client and shut my mouth. The moral of this story is, if you can afford to ‘walk’ (don’t need their money) and feel the ego tug, state that is what you will do if you don’t get the sum you feel you need. You may be out on the street faster than you think. But if you prefer your pay check and are just feeling the ego tug, think twice before rocking your (very small) boat. great advice for multiple occupations! Great piece, with advice well worth heeding. Thanks.